I waffled back and forth on where Gretel and I were going to do our 4-day backpacking trip because the fall mountain forecast was changing daily. 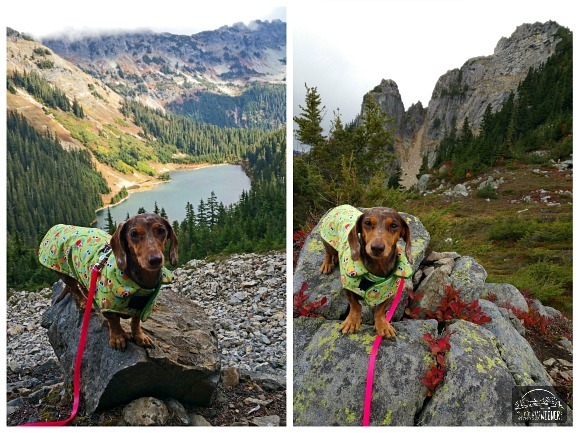 I decided at the last-minute to go with Plan A – one of the best dog friendly hikes near Seattle – with one modification. 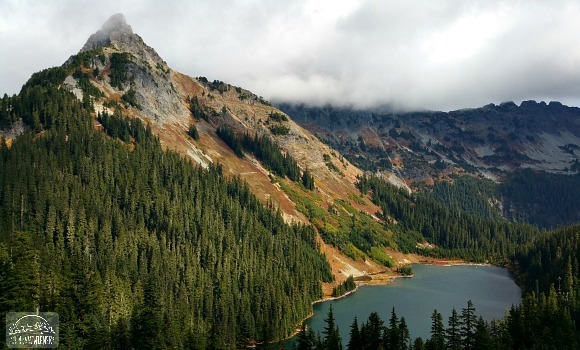 We were going to do an out and back hike instead of a loop, cutting out the Kachess Lake and Mineral Creek Trails to Parks Lakes. Once I did more research, I found out that trail was pretty rough and brushy. 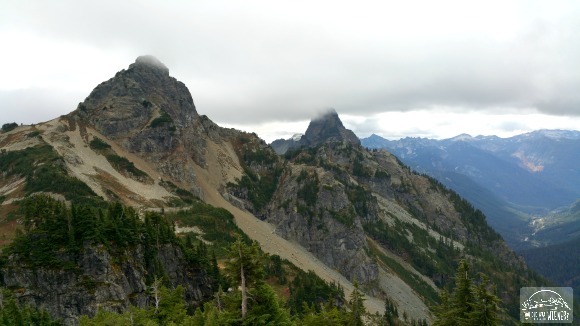 I didn’t really want to deal with that, especially in the rain when it would be really wet, so we decided to do an out and back hike starting from Snoqualmie Pass. Days before our trip I hit up REI for a ton of last-minute things and spent WAY too much money. It was all stuff I needed, or at least I convinced myself that I needed. Ha, ha. 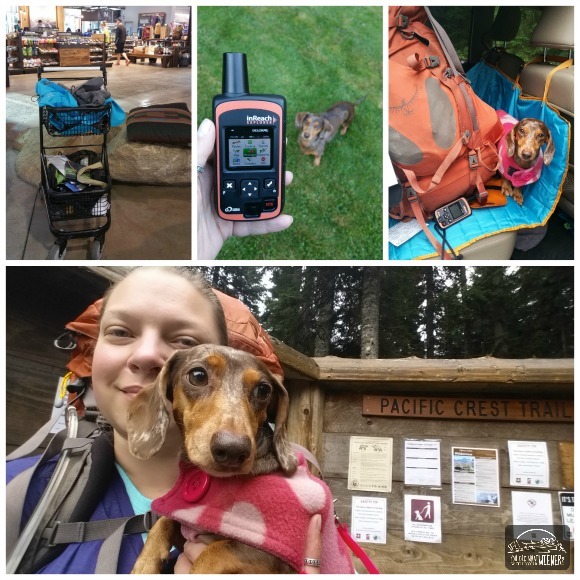 One of the things I picked up that I did need – and that Hubby absolutely insisted upon since I would be hiking alone with Gretel – was a DeLorme inReach Explorer Satellite Messenger that would allow me to stay in contact with him via text and update him on how Gretel and I were doing. He could also follow our progress on a map because the unit also has a GPS. So Friday morning we arrived at the trailhead, packed up, and headed up the Pacific Crest Trail toward the Kendall Katwalk. There were no weather surprises on the way up – I knew it would be raining on us all day and we wouldn’t be able to see much. We hiked 6 miles uphill in the rain and fog. This is the only picture I got of that part of the hike – the Kendall Katwalk in the fog. I had hiked to this point before but it was on a sunny day. 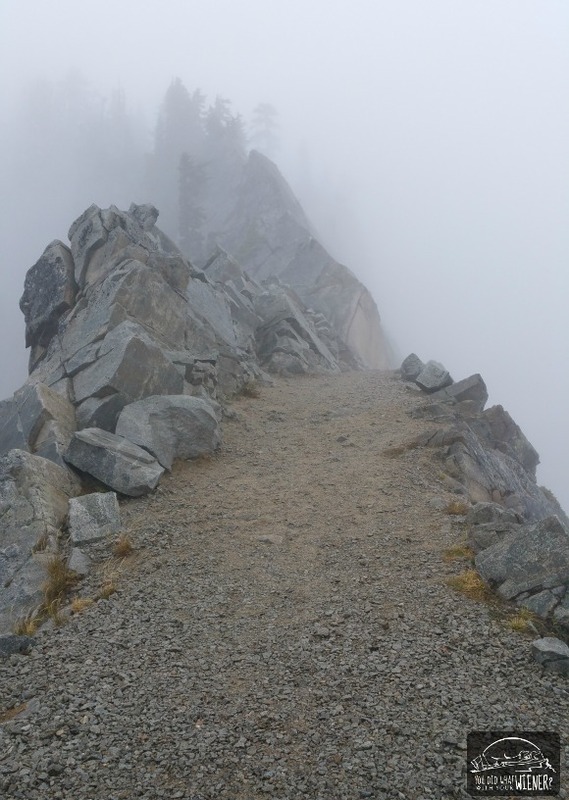 The fog added a mysterious feel to it and I was actually more nervous than last time crossing this trail blasted into the side of the sheer ridge. I am not afraid of heights so the sheer drop off didn’t bother me but the surrounding fog made it harder to get my bearings and gave me a bit of vertigo. It’s totally safe though, I swear 🙂 (no, really, it is. The trail is very wide and there are rocks lining the outside edge of it). We took an accidental detour to get to camp. I had never been to this area and, looking at the map, it looked like we could camp at Edds Lake a little over 8 miles in. It turns out that Edds Lake is at the bottom of a cliff so that was a no-go. We turned around destined for Ridge and Gravel Lakes (which made about 9 miles total for the day). 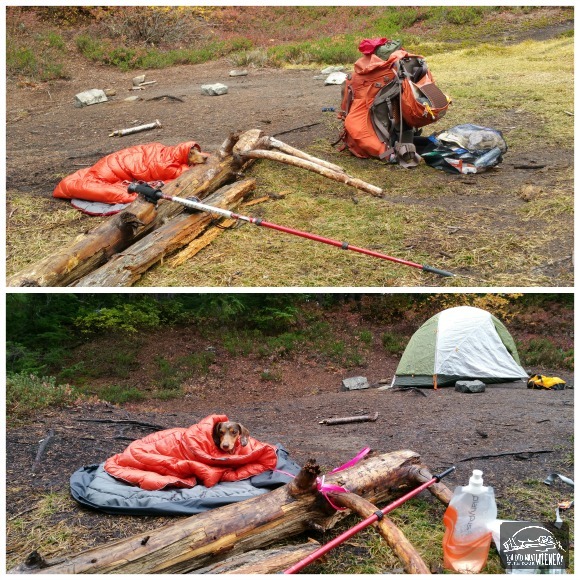 I picked a tent spot at Ridge Lake that was on a bit of a slope so the water would run off and not settle under the tent if it rained all night… which it did. I set up Gretel on her camp bed with her camp blanket and the freeloader watched me to all the work to set up camp. Ha, ha. It was a bit windy that night. I could hear the wind blowing through the treetops like a freight train but our tent was sheltered so we only felt the wind shake the tent a few times. We got a good 12 hours of sleep and hit the trail the next morning as the sun was coming out. We hiked back past Edds Lake and around Joe Lake to the trail traversing below Huckleberry Mountain. Huckleberry Mountain. You can see the trail traversing below it if you look close. It’s here where I have to pause to warn you about this trail. The views are amazing. However, it is NOT a place to go if you want to be left alone with only your thoughts and the sound of the wilderness. 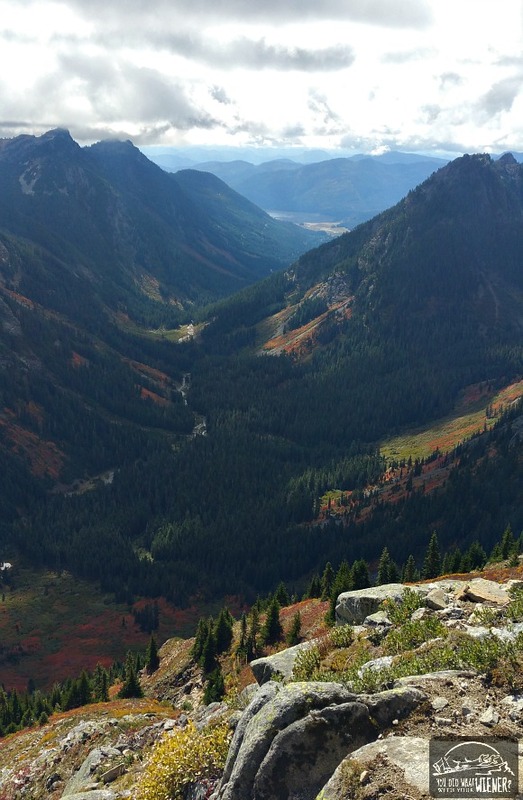 The trail to Kendall Katwalk starts at Snoqualmie Pass and Interstate 90. You can hear the roar of traffic for most of the way up to the Kendall Katwalk. Once that sound dissipates, it is replaced with something else. I don’t know what the regulations are in this area but they very obviously allow for the military to practice flying fighter jets in the mountains. I’m talking the super loud, sonic fighter jets and I am talking often. I had seen one or two up there before on a day trip but I would say there was one flying nearby approximately every two hours (thankfully they didn’t fly at night). The fighter jet thing was disappointing and cool at the same time. Ok… it was mostly disappointing. I admit that I was hoping for a little more peace and quiet. Call me spoiled but one usually expects that when they hike 9 miles into a Wilderness Area. I dealt with it though and it certainly didn’t ruin the trip. If you like seeing fighter jets practice maneuvers, it would be pretty cool for you though. We did encounter one situation that totally scared the crap out of me but it was a pretty unique experience. We were hiking through the saddle between Huckleberry Mountain and Chikamin Peak when I heard the sonic roar of a fighter jet off in the distance. I looked across the valley to see if I could spot it but I couldn’t. THEN, out of nowhere, it zoomed right over my head. Seriously, I am pretty sure it was only a couple hundred feet above us! It shook my nerves a little but I had never seen a fighter jet flying that close. There was something cool about it. Anyway, we made it a bit past Chikamin Peak and stopped for lunch. Even though there were still some high clouds, the views were amazing. WOW!! What an amazing trip. Looks like you had a great time – and the photos are beautiful. So glad that I can live vicariously through you as I sit here in flat-land Florida eating Beggin’ Strips and laying on the tile to cool off. PS – love Gretel’s jacket! Oh, and that GPS thing is super awesome, too! Can’t wait to read about more of your hikes – I love it!!!! I am working on writing a posts about the GPS/emergency beacon. I’ve had a few people ask me about it already. I don’t know why I waited so long to get one! We certainly to have more mountains here than in Florida. Our friend Oz the Terrier is from Florida though and he does a lot of adventuring there. I love this so much! That foggy trail would have definitely freaked me out. What a trooper Gretel is. Your picture in front of the PCT sign made me all teary because WILD. The PCT has gotten so much more crowded since WILD. There has been talk about limiting traffic via permits. I think that is only for people planning to do the whole thing though. I did run into a couple of guys heading to Canada but no thru-hiking women. I do hope to do a 72 mile section next year. I want to take Gretel but it would take at least 12 days. 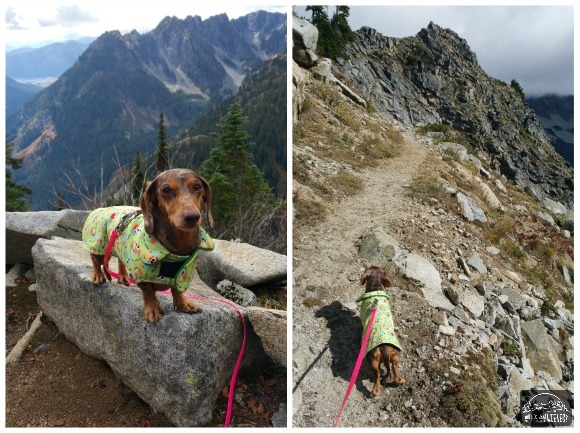 If she was going to hike that many days in a row we would have to make them shorter days and/or take a rest day or two so it would probably take us 2.5 weeks! I am drooling over those views! When I come out next year I’d love to try this one. It looks absolutely gorgeous. That fighter jet thing can certainly scare the crap out of you. We live near an Air Force base as well as a smaller airport where air shows are frequently held. Super loud! Well definitely let me know when you are here. 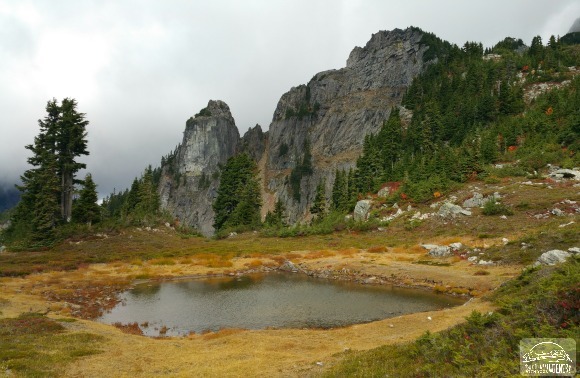 There are some other hikes in the same area – long day hikes – that are just as spectacular (if you are short on time). Will you be pup-less when you come out? I am not sure yet. If I fly, I will not have a dog with me. However, if I have a larger van by then, I may make it a road trip and bring a dog. Will you be at Seattle Pet Expo? Is that when you are coming? I am at BlogPaws June 22nd through 26th but I will be around before or after that. Yeah, I knew there was a chance it would rain that whole first day. Seeing as how we cut the hike one day short, we could have started a day later and avoided that mess. I didn’t know though. Beautiful pictures and exciting adventures! We climbed Enchanted Rock here in Texas last weekend and it gave me vertigo LOL, so I can understand how you felt. I’ve also seen fighter jets close and it is awesome (they did a fly over at a Rangers game one July 4th and we were in the very top row of the stadium, wow!). Not sure if I would want to have one fly over while on the trail! The views are amazing! Was Gretel freaked out by the noise at all? She looks super cute in her coats. It didn’t phase her at all. She didn’t move a bit when the mouse snuck into my backpack (outside our tent) and tried to eat my chocolate macaroons. Ha, ha. I think she was just so tired. Me on the other hand, I heard EVERY. TINY. NOISE. and it made it hard for me to fall asleep. Great photos, as always! I love the first one of you and Gretel! So precious! Looks like you guys had a great time! Wow, super cool! Your adventures inspire me to get out with my girls more! I think you would like car camping where you can do a short day hike or two though. Camping stuff has come a long way in 10 years and you can make is almost luxurious now. The fresh air is great and I love seeming how much it lights my dogs up.